VT-23400—Four-drawer cabinet with tooling capacity for 33 full-length dies and 11 full-length punches; four 7-in.drawers (three for dies and one for punches). VT-23500—Four-drawer cabinet, with tooling capacity for 33 full-length dies and 11 full-length punches; one 3-in. drawer and two 7-in. drawers for dies; and one 10-in. drawer for punches. 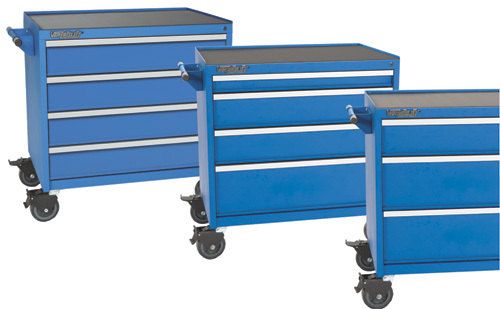 VT-23600 –Three-drawer cabinet, with tooling capacity for 22 full-length dies and 11 full-length punches; one 7-in. drawer for dies; two 10-in. drawers for punches. All Versatility Professional Tool Storage cabinets feature robotically arc welded steel construction and a durable powder-coat finish. Other features: lockable drawers, tubular handle with grips, and heavy-duty 6-in.-dia. casters.